The semiconductor intellectual property (IP) industry is two decades old, but questions are still being asked about what’s wrong with it and what needs to be fixed. Normally these kinds of issues are reserved for fast-moving, young industries, not one that is the backbone of semiconductors. Design reuse has become an indispensable part of the design of nearly all electronic systems. It is now the largest segment of the EDA industry, and yet the industry is still asking fundamental question about how to make reuse more cost-effective, more efficient and more standardized. IP developers are struggling to meet increasing demands that are being placed on them, while simultaneously dealing with demographic changes in their markets. Can small IP developers survive? Or will the market continue to shrink until only a few large aggregators exist? At the Design Automation Conference this year there were several panels, sessions and talks that discussed why such an important part of the semiconductor industry is in such disarray and whether the problem getting better or worse. Jim Feldhan, founder of Semico Research, presented some of the numbers associated with the industry. He said IP is growing faster than semiconductors in general, especially when looked at from a unit perspective. In dollar terms, it is more stable and approaching 50% of the total dollars for semiconductors. The mix of design starts is expected to change over the next few years with today’s largest category, the performance SoC expected to decline. Part of the slack is taken up by the ‘value SoC,’ which Feldhan says is found in consumer devices such as TVs and home automation, but the biggest area of growth will be ‘basic SoCs’, such as those found in the IoT and industrial applications. Integration problems aside, it would appear as if the IP industry has a few good years ahead of it and can expect to see revenues increase. However, the easy money may have already been made and extracting profit from the development of IP may start getting a lot more difficult. This is driven by changing requirements along various axes. To compete in the latest devices means working with the foundries, in some cases for years, while a new process technology is being developed. To address the integration issues, more views and more collateral has to be provided with the IP. Diversification of the industry means that IP has to become a lot more customized and each variant will have fewer potential customers. All these are changing the cost/reward equation. “Even if we consider a standard’s based piece of IP, we need all the views,” counters Vemury. “It’s also your support model. Are you just going to provide IP and be done with it, or take them to tapeout? Then you have to go through all the interoperability and standards compliance. How high up do you go in the stack: drivers? Become a trusted partner, not just an IP provider. A lot has changed since the emergence of the IP-based methodology and it is currently going through a major update. The creation of tools and standards for IP integration is progressing at a snail’s pace, but there is hope. New standards and fabrication methodologies may cause a disruption. With so many unknowns about future designs, it’s hard to figure out where to place bets. 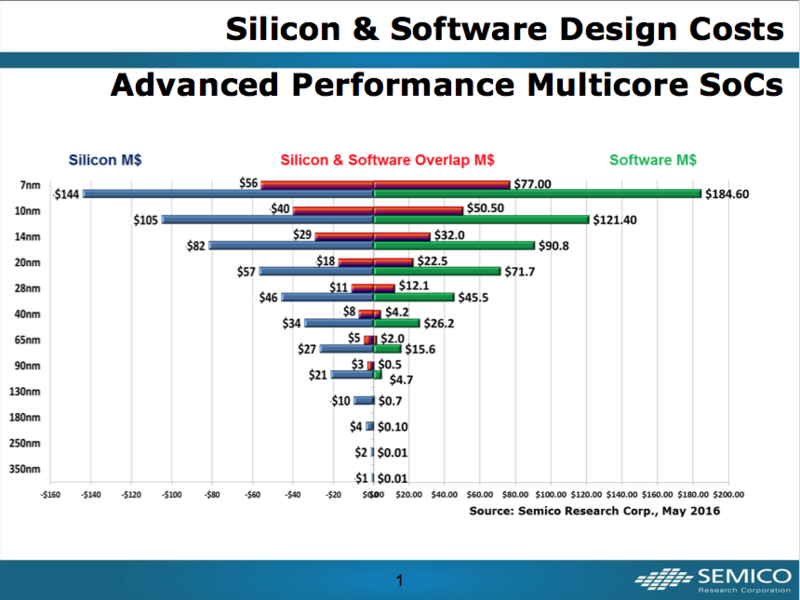 Given the Semico chart, I can see the IP market easily bifurcate into advanced nodes vs. ‘commercial/consumer’ nodes. Advanced will have riskier and more complex designed IP (due to FinFETs, FDSOI, etc) while the consumer will be focused on 28nm and ‘looser’ nodes. I would expect IP pricing to reflect the risks vs. stability. Only companies with the financial strength will go after the riskier development. This could be large or small IP vendors. No question, the Memory and A/MS IP will cause migration issues if companies want to integrate into a homogeneous solution. I thought it was a waste to migrate a perfectly good PHY from 130nm to any other denser node but until sub 28nm was hit, many followed the pied piper to denser nodes….but economics finally turned on all. Over the next few years, it will be quite interesting to see how the IP consumers and providers modify how/what business they do forced by new economics. Hi Bill – I agree that the future will be interesting to see how it works out and how the IP industry transforms itself. It is also interesting that this article was published just days before the ARM announcement. We shall see if ARM saw the writing on the wall and decided it would be foolish not to accept the offer.